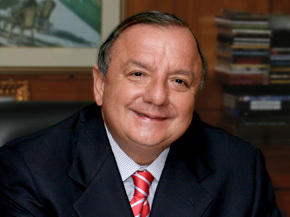 Presidential pre candidate Alvaro Noboa, assured that he is being victim of a political persecution from the government and the Tax Revenue Service (SRI, from its Spanish acronym), with the sole purpose of made Bananera Noboa bankrupts and prevent him to participate in the next elections. According to the opinion polls realized to the ecuadorians, Noboa said he feels part of the 72% that doesn’t trust the CNE, as a regulatory arbitrate in the presidential elections. “I’m part of that 72% that doesn’t trust in having a transparent election. But we must remember who is the head of the National Electoral Council (CNE), of the Constitutional Court and of many courts; is our actual President, Rafael Correa”. GONZALO ROSERO: At this moment, the production department have confirmed that we are now in contact with presidential candidate, Álvaro Noboa. Mr. Counselor, can you confirm, do you hear me perfectly from the city of Guayaquil? A very good day to you, its journalist Gonzalo Rosero from the Democracia chain bothering you, Counselor. ÁLVARO NOBOA: Thank you very much, Gonzalo, I hear you perfectly. It’s an honor to be interviewed by you. GONZALO ROSERO: How very kind, thank you very much, very generous. I have just received a report from the agency, or better said, from the social opinion survey company, Polibio Córdova, the Cedatos company. In the way of breaking news, they are revealing to us the results regarding the opinion of Ecuadorian citizens regarding the reliability or credibility of the National Electoral Counsel studied in this sample. As you are a firm candidate in your fifth attempt to become President of the Republic, I would like for you to give us an opinion. I will give you the results: it says that 72% of those surveyed pronounce themselves as against the Electoral Counsel in terms of no-confidence. That is to say, 72% of those consulted in terms of a vote of NO confidence in the current electoral arbitrator. 28% say that they do believe in the Electoral body. Those numbers make me think of unlawfulness and that, therefore, there could be problems. Would you request an rectifying approach from those who are exercising the task of arbitrator in this campaign and the election? What complaints are you going to raise against the Electoral Counsel or do you see them as resolved to respect the decision of the Ecuadorian people? Please go ahead with your first response, Counselor, if you would be so kind. ÁLVARO NOBOA: I am part of those 72% who have NO confidence in that we are going to have transparent elections. But, let’s remember who is the Chief of the National Electoral Counsel, who is the Head of the Courts, who is the Head of many Tribunals, it’s the current Head of State, Rafael Correa, so there is where the weakness stems from. I, in particular, am persecuted perennially via the arm of the IRS. They also have the Superintendence of Companies in order to persecute the Grupo Noboa companies, with the aim of intimidating me so that I won’t participate in the elections, given that in our surveys, Economist Correa has 36% and falling; Álvaro Noboa, 21% and rising; Guillermo Lasso, 3%; Alberto Acosta, 2%; and Lucio Gutiérrez, 2%. Economist Carlos Marx has even put a date on, in one way or another, liquidating one of the Grupo Noboa companies, Exportadora Bananera Noboa. GONZALO ROSERO: Where have you got those numbers from? Excuse me, Counselor. ÁLVARO NOBOA: I’m going to give it to them, says Economist Carlos Marx. That he’s going to do so between September 15 and October 15. You know what the coincidence is? That October 15 is the date for the inscription of my Presidential campaign. Or that is to say, that he has to act in order to intimidate me so that I won’t participate. The numbers come from Mercanoboa, a very old Grupo Noboa company that since the year ’98 has been carrying out surveys, it’s expert in market surveys because it has to do surveys for Café, for Avena Quaker, etc., and every professional pollster also has a methodology specific to political polling. Therefore they are surveys that have been tested. GONZALO ROSERO: But it is a survey from one of your companies called Mercanoboa. ÁLVARO NOBOA: Of course, but I don’t lie. Something that my father taught me is to never lie. I have to say that yes, that’s right, but that being one of our companies doesn’t mean that we are going to fool the public nor ourselves. GONZALO ROSERO: But they wouldn’t be lying to you, like Avena Quaker to you? ÁLVARO NOBOA: Let’s hope not. GONZALO ROSERO: Because, in reality, Avena Quaker has a gigantic following at this moment in the media and among the popular sectors, so they could be lying the other times, lying to you or not lying, because on one occasion you even won the election from my particular angle as a journalist. I am almost sure that you won one of the elections, one, precisely, I don’t want to refer to the candidate who you beat, of this, yes, I was very sure and I said so publicly. One of the elections, Mr. Noboa won. He beat them all, but I can’t speak of the other results. Fine, then, Mercanoboa has never lied to you. ÁLVARO NOBOA: That I don’t lie. GONZALO ROSERO: No, that Mercanoboa has not lied to you. ÁLVARO NOBOA: No, and that that company has not lied to me and every time we work with them, they only have a 2% error margin. Even though Rafael Correa goes around saying that he has never lost a Presidential election and that he was going to win in only one round, and he lost the elections, and my surveyors, Mercanoboa, said that he was going to lose the elections and he lost them, and he even put out a song that said “only one round” . If you remember that and, well, he didn’t do it, that one round. How is he going to make it in one round if he, because of his temperament, has fought with the entire country? So, returning to the topic of the taxes, I am totally in agreement that these are not going to be transparent elections. I have even asked for Economist Rafael Correa’s renunciation, so that he would leave the presidency to the Vice-President, who has a very good reputation, and is someone I respect, he’s a balanced man, a socialist man. I had Alfredo Castillo as my Vice-Presidential candidate – when I won in ’98 – a socialist. I am in favor of leftwing ideas in regards to social service, in what is the area of healthcare, etc., etc. I believe that in the area of production, the world has already tried it, and for that reason Russia abandoned communism and has proven that free enterprise, the free market, investment, judicial due process is indispensible to be able to produce and for freedom. In this country there is neither freedom, nor foreign investment, nor judicial guarantees, nor free enterprise, nothing. Why do we an economy that is still good? Because of the price of petroleum, but a country can not depend on the price of petroleum, and petroleum can’t employ every Ecuadorian. There are almost 2 million Ecuadorians who live on less than $2 a day, they are the ones who receive the voucher. Poor people, between zero and $2 dollars, it’s good that they receive the voucher, but my proposal is different. My proposal is that that man raise his level of education in such a way that when a foreign company comes, I am going to require them to train the workers so they become specialized workers, and can get between $1,200, $2,000 or $3,000 dollars a month. I am going to ask universities to develop a practical educational program. It doesn’t make sense that Ecuador, which is the top banana producing country, doesn’t have the best university for banana production. That today is in Honduras. That tourism be developed. If we had 2 million floating tourists in Ecuador over the whole year, we would have 2 million new employees, because for every floating tourist, one Ecuadorian is required to attend to them. So that is 2 million new jobs. Therein lies the secret to why they are going to have the ability to have a cement house, a car, a well-paid job and a level of training and a university level or a very good technical specialization. GONZALO ROSERO: You have the formula, Counselor. Why don’t you try that formula in your companies? ÁLVARO NOBOA: I try it constantly and am constantly putting it into practice. GONZALO ROSERO: What have you done regarding education in your companies, Counselor, in order to have confidence that you would do the same on a national level? ÁLVARO NOBOA: We do training, I will give you two or three examples. There is, in the Industrial Molinera, an English miller. That English miller earned $5,000 or more dollars a month. A man who earned a basic salary began learning the business from the Englishman and today that man who earned a basic salary, is earning $5,000 a month. I have another example. Mr. Marcos Lainez, was a man who worked maintaining apartments in Salinas. Today he is an international assistant of mine. He goes throughout the world with me, he’s learning English, soon he’s going to take other university training courses and he was a PRIAN candidate. So, that shows that when there is capability, a man who earned a basic salary can begin to earn a lot more and he’s training himself to keep rising on the scale of income and in the scale of knowledge. GONZALO ROSERO: Okay, but the majority of your workers, of your employees, the benefits you have taught them with what you want to generate in the country, let’s say, that formula that you are revealing to us. ÁLVARO NOBOA: Our farms, which are one of the biggest employers, have training with what we call an internal school for banana production in house, with an administrative office. GONZALO ROSERO: But you could have made the first University for Banana Production in the name of your companies, for the benefit of your labor leaders. That would have been fantastic and for the benefit of the countryside and of the rural shantytowns that would have attended. It’s just an idea that I am suggesting to you. And these educational units would have been a clear demonstration of your formula for changing education in our country. Our education has to be technical and very pragmatic, aligned with functions of enterprise, and with the reality of our farms and with our productive axes. Don’t you believe that the directions lie there? GONZALO ROSERO: But one has to preach by doing, no? ÁLVARO NOBOA: Well, you know that we “do” in many things. In the area of healthcare, we regularly have the medical brigades working throughout the country donating free medicine and doctors who don’t charge, either, and that our social work has gone on for 30 years. GONZALO ROSERO: You only get it going when you are a candidate: is that the truth or a lie? ÁLVARO NOBOA: 30 years it’s been working, since 1978, when the institution called the New Humanity Crusade was established, and I receive reports via text from my wife Annabella, who is in charge together with Dr. Jenny Arteaga, about what neighborhood they are working in and it gives me great pleasure: this week we are going to work in this neighborhood, that week we are going to work in such and such farm. Because charity begins at home and our farms are also attended by those medical brigades. GONZALO ROSERO: The woman is inspired to be able to attend to those issues. Well, it would be to give you a much national-level arena. But speaking of arenas, tax is not your strong point, and there are a lot of people who believe that Counselor Álvaro Noboa doesn’t like to pay taxes. ÁLVARO NOBOA: Of course. Look, a lie said a thousand times becomes a truth. I have at this moment, on the air on television communications wherein I explain that I am the biggest personal taxpayer in the country, that no other wealthy person in Ecuador, like the Eljuri’s like my sister, Isabel, like Fidel Egas, pays what I pay. GONZALO ROSERO: How much have you paid this last year, or how much are you thinking of paying. Because we are already in the last day, no, payment is already due. You should have the total so sum of the financial assessment for all of the companies. How does the country see it, especially the country of the streets, the country of the neighborhoods, of the countrysides that are listening to us? How much, globally, do Álvaro Noboa’s companies pay in taxes? ÁLVARO NOBOA: In personal tax, as Álvaro Noboa, he’s been given something like $500,000 [to pay] and I am the biggest contributor to Social Security. It’s also a very good question. The consolidated group of companies pay millions of dollars. GONZALO ROSERO: Okay, but let’s see, how much. ÁLVARO NOBOA: I don’t have the exact number in front of me, but I do have the category. Grupo Nobo is among the nine companies that pay the most taxes in the country, consolidatedly. GONZALO ROSERO: Right, those hundred millions under discussion with Carlos Marx Carrasco, as a the highest functionary of the government of President Correa in regards to tax, why do you have the discrepancy between the IRS auditors and the auditors of the companies of Álvaro Noboa? Could you tell me a little of the story, Counselor? ÁLVARO NOBOA: Fine, that’s what has us dumbfounded. Why are they charging Chiquita $35,000 dollars, Dole $700,000 dollars, which exports more than us, and from us they want to charge $49 million dollars plus interest, and you tell me why they are fining us? GONZALO ROSERO: And why are they fining you, Counselor. ÁLVARO NOBOA: Because that’s what they want to do. But not on capital on base taxes. They want to charge us $49 million dollars plus fines and interest. GONZALO ROSERO: That’s what I’m saying: why do they want to charge interest? ÁLVARO NOBOA: I would love it if you were my lawyer or representative, and, like a radio interviewer you would ask Economist Mr. Carlos Marx Carrasco, why do you want to charge Dole $700,000 and Noboa $49 million dollars? If Dole is bigger than Noboa, why do you charge Chiquita $35,000 dollars and Noboa $49 million dollars? GONZALO ROSERO: Counselor, and if I would compare what you pay with what the Grupo Eljuri pays, who pays more? ÁLVARO NOBOA: I have spoken with Juan, Juan is my good friend, and our group pays the most of all, the Grupo Eljuri and the Grupo del Banco del Pichincha with Mr. Fidel Egas, but Chiquita, which is much bigger than I pays $35,000 dollars. If Dole is larger than Noboa, they charge it $700,000, and Noboa $49 million dollars, that only tells me that it is political persecution and that if you repeat a lie a thousand times, it becomes a truth. Álvaro Noboa and Grupo Noboa are the biggest tax payers in Ecuador, and let’s see if I repeat it a thousand times, a can counteract Economist Carlos Marx’s dirty war. GONZALO ROSERO: Do you believe — as we say, Mr. Carlos Marx Carrasco has his eyes peeled for Mr. Alvaro Noboa — that is to say, he has you like a specimen – like the Leo Dan song says – like a specimen in order to pressure you, to aggravate you, and to charge you more taxes than the rest of the most significant economic groups in the country. You are given special dedication by the IRS director against the Grupo Noboa and Álvaro Noboa. ÁLVARO NOBOA: Economist Carlos Marx is a fourth rank employee and you know that the President is first rank, because the Vice-President is second rank, the Ministers are third, the Secretaries fourth, and Economist Carlos Marx is fifth or sixth. The owner of the circus is Economist Rafael Correa. If he’s got his eyes peeled for me because he doesn’t want me to run against him, and I have news for him, there are more Anti-Correans than pro-Correans in Ecuador, that is to say that if I get into the first or second electoral round, I am President of Ecuador, and he is going to do everything to prevent that from happening. GONZALO ROSERO: And in your condition as candidate for President of the Republic for the fifth time, there is no bad fifth, they say, you, what you are always looking for is to maintain yourself in a very distinguished state of political influence and then the Assembly stuff comes and there, at some moment, the next President is going to need it, Correa if he ends up re-elected. ÁLVARO NOBOA: I believe this is my best moment. ÁLVARO NOBOA: For many reasons. I have matured. My ideas are much clearer, about how to combat poverty. Ecuador is tired of tyranny. It is tired of poverty. They are not going to say it on the radio, the listeners, because they are afraid. But the people, when I speak with the public employee – who I thought was allied to economist Rafael Correa – they are going to vote against him. The police are going to vote against him. The military are going to vote against him. The people from the poor neighborhoods who get $2 a day are going to vote against him. Teachers are going to vote against him. The left who gave him his victory in 2006, MPD, Pachakutik, Leon Ródos, he had a sea of votes. All of them are going to vote against him. The Press who were on a honeymoon with Economist Rafael Correa in 2006, today are totally against him because they have been intimidated, they go around blackmailing them all the time. “If you are not with me, I am not going to send Government advertisement, I’m going to do such and such.” The Court raised its voice and is against him because, for a or b reason, they declared a resolution against the Government, they imprison a judge, and the transport workers are against him. ÁLVARO NOBOA: Economist Correa has insulted them. He’s told them that they are people with bad reputations, so I receive people every day. I also want to say that since ’98 when I won the elections, in 2006 when I won the first round, I have never had a flesh and blood survey showing such strong support as I had last Saturday in Guayaquil, where we had 12,000 people who went to a National Assembly at the Industrial Molinera and that there was a fair of political happiness. So I have to be sincere, because politicians love to exaggerate – there was an Assembly with 5,000, 6,000, 7,000 people – please, ask for the photos, ask for the videos. There were 12,000 people. GONZALO ROSERO: Excuse me, Counselor. Do you believe that the people are afraid? ÁLVARO NOBOA: Because I have spoken with the people of the towns. Imagine you’re in a neighborhood where Economist Rafael Correa loses. He puts it on the black list, and then he takes away the voucher, he doesn’t send them works, he sends the police to see how he can imprison them, like whoever walks in the street with a beer, it’s convenient to make their lives impossible and the people are sick of it. Ecuador doesn’t bow before anyone. Before there were the Spanish, and it gained independence in 1822. It didn’t bow before the conservatives, and it had the liberal revolution in 1905, on May 28, 1940, because it didn’t want to bow, and in the last 10 or 15 years, it has thrown out six or seven Presidents because it hasn’t wanted to submit. GONZALO ROSERO: But there are people who are totally, poor people from the most working class neighborhoods of Ecuador, who are sure that the only one who has remembered us is President Rafael Correa, and they put their quantitative hopes in the results of the month of February, because there’s no longer a middle class. That’s to be seen, say some analysts in the Democracía channel. Candidate Álvaro Noboa, will be candidate – you still aren’t candidates nor President of the Republic, but I say precandidate for President of the Republic for the fifth occasion, but there are people who are sure that that he is the only one – and I repeat it like four times – that has remembered them, they say, is Rafael Correa. Do you believe that President Correa has worked exclusively towards the benefit of rescuing the adherence of the popular zones, that those are the ones that are going to give him electoral strength in the next months? It’s as if they would ask a poor person, “Hey, what’s better, to be without the voucher and dying of hunger, or with the voucher? The poor person is going to say, well, of course, I am better with the voucher. “Hey, are the highways better or worse?” Of course they are better, but that isn’t development. That keeps us firmly in the third world, and my offer is a thousand times better. My offer is that that poor man is trained, that he becomes part of the middle class, that he earns $1,000, $2,000, $3,000 dollars a month, that he can pay the loan for a cement house, that he can pay the loan for a car. That’s not development, my offer is much better. GONZALO ROSERO: How would you finance your agenda of guarantees for the poor? Via what economic model would you support that kind of social investment? ÁLVARO NOBOA: Via the model that they are following in Chile, which in five years will be like a developed country. GONZALO ROSERO: But there is poverty in Chile. Poverty is not going to disappear with any model, that’s for certain, we are in agreement. ÁLVARO NOBOA: No, I don’t believe that poverty doesn’t have any chance of disappearing. Poverty is going to disappear and has disappeared. In Sweden there is no poverty. in Chile there is no poverty. In the United States, the poorest is the same as a middle class Ecuadorian, so there is no poverty in those countries. Poverty according to the world’s definition that it’s those who receive $2 a day. In Ecuador, millions receive $2 a day via the voucher, and they are in a total state of poverty. The problem for those people will be resolved brining a thousand billionaires who I know, and those I don’t know but who also want to come, to set up business here in Ecuador. That the taxes on income are lowered to what they ask, and I am happy because the Treasure will be able to grow much more with a little less in taxes, but multiplied by a thousand. They also want judicial guarantees, and we give them judicial guarantees that the State won’t end up expropriating them, so that if there is a problem tomorrow regarding this, that or the other, there won’t be a judge afraid to impose justice. What they most want is a free market, free enterprise, things that communist countries like China have – and therefore China, being communist, is replete with investors – that is what I want for Ecuador. GONZALO ROSERO: And the investors aren’t miracle workers. They are going to come in order to earn a lot of money and here you are going to open doors and windows. In what way would you captivate them into coming and investing in Ecuador, Counselor? ÁLVARO NOBOA: Look, I am going to tell you something. I am the best man in Ecuador for making money, and I am tired of making money just for me, and now I want to make money for the poor. So I am telling them that one of the laws of making money is that while you are making money, don’t move from there. The many who comes to make money in Ecuador, his desire to make money means that he’ll bring in more money to Ecuador every day, because what he wants is to earn more each day. He doesn’t want, as the people say, to take his money away. GONZALO ROSERO: For sure, the people who are listening to this interview, Counselor, are going to tell you: Counselor Noboa, take a break. Don’t make so much money. That money is better shared out, that it gives you a break, pay the taxes, and you just relax, and the fight with the IRS will come to an end. “Relax” isn’t advice, it’s just the logical conclusion if you are tired of making money. Why not pay the taxes? ÁLVARO NOBOA: I am a victim of a lie being repeated a thousand times become the truth. You keep on talking to me about the taxes, when I keep telling you that I and Grupo Noboa are the biggest taxpayers in the country. It’s like I would tell you a thousand time, that you are short, and you are a tall man, and I would repeat it a thousand times that you are short. You’ll end up being short because I thought you were short. It’s the same thing if you keep talking to me about the taxes. GONZALO ROSERO: That’s common sense, what you’ve just said. ÁLVARO NOBOA: But I am the biggest taxpayer in Ecuador. Listen, in each campaign they come up with some kind of dirty war. Economist Correa is very afraid of losing these elections. I have told you, he’s got the whole country against him. I have told you about the economic model that is working in China, that is working in Chile, and that is working in South Korea, and you return to the thing about taxes, you’ve got into it on the basis of repeating it ten thousand times. GONZALO ROSERO: They’ve convinced me! ÁLVARO NOBOA: That’s what Rafael Correa wants. GONZALO ROSERO: And forgive me, Counselor, what do you know about the latest scandal, about the credit, of this person who they say is a no-good, and they come into your country saying that they are of Argentinean nationality and it’s a well-respected country, but this Mr. Duzac. What have you heard about what they are trying to do? And well, it looks like they’ve been surprised, and there’s a loan in the middle of it all, and endless number of hemispheres that wouldn’t be able to explain to us, and the Government has also not chosen the road of making transparent what this Mr. Duzac has done. Where has Mr. Delgado, a cousin of the President of the Republic found himself? What is it that they are trying to do internationally? There are delicate things, and one is even sick of speaking of these issues, and it is the obligation of the Press to follow these issues, so that the suitcase thing doesn’t happen. So, regarding this issue, what do you know, Counselor Álvaro Noboa? ÁLVARO NOBOA: The most corrupt Government. The most corrupt Government that I can remember is Economist Correa’s. The corruption began with the accusation of links between him and the FARC. The accusations continue. The curious case of the big brother, Fabricio alleges that he is innocent in this. The accusations continue with the famous proof of the suitcase. Accusations of all kinds continue, that you hear them in the press is just one accusation more against a Government that is famous for being corrupt. The other terrible problem that Ecuador has is the violence and the criminality of this Government. I am going to get in touch with Giuliani, who cleaned up the crime in New York, for some advice, so that he’ll come here and restructure the system of control and security in the country, and in the poor neighborhoods so that there won’t be the crime there is now. GONZALO ROSERO: He’s your friend, Mr. Giuliani? ÁLVARO NOBOA: No he’s not my friend but he was the mayor of New York, and so he has done that work, he advises countries throughout the world and can count his successes. So, the best experts from the world over have to come here and bring an end to Ecuador’s three problems: Unemployment, number one; economic problems, number two; and crime, number three. I want to tell you about economic problems. One of them is the following: what does it help if you earn double, if things cost three times as much here in Ecuador? When there is a rice harvest, they import rice which ends up bankrupting the farmer. Oh, that’s another army which is against Correa. When there is a corn harvest, they import corn in order to bankrupt the farmer. So it’s very important to bring an end to all that and to set about resolving the economic problems of the country. We don’t have a free trade agreement with most of the countries in the world: Chile, China has a free trade agreement with almost all of the world. We keep trying to avoid Fidel Castro’s economy, but Economist Correa – and I respect his point of view – is not something good for the middle class. All his life he’s been a poor man. He believes in poverty just like Fidel Castro believes in poverty. But Ecuadorians don’t believe in poverty. So Cuba has been poor for fifty years, and half of the population has left. Ecuador has been poor fifty years and around three or four million Ecuadorians have left in the last years. Even when they stole the elections from me in ’98, which coincides with the statistics from ’98 to 2000, it was one of the biggest periods of migration. And those Ecuadorians who work abroad, it was very successful, because they work within the rules of the free market, of free enterprise. They work with a justice system that functions, rules of work that function. Cristina Aguilera is the daughter of an Ecuadorian; John Paulson, a highly respected friend of mine is one of the richest men in the world and the son of an Ecuadorian. There are mattress distribution factories in the United States that belong to an Ecuadorian, that factory is the biggest distributor of mattresses in the United States. You call 1800 and they’ll br4ing you a bed or a mattress that same day, so there are Ecuadorians who have good working conditions that function perfectly. GONZALO ROSERO: There is inventiveness, there are good strengths in the Ecuadorian. You believe a lot in the human capital of our country. Now the issue is the economic model, it’s as if it isn’t very clear. Why do you believe that the Ecuadorian people, electorally, have never understood you, or if they have understood, they frustrated your administration of the country once and you lost the elections on more than one opportunity. Now as I said just a few seconds ago, there’s no bad fifth, Counselor Álvaro Noboa, why do you believe you could win at this juncture? ÁLVARO NOBOA: You understood me in ’98, you understood me in 2006 in the first round. In ’98, quite simply, they stole the elections from me, and in 2006, the left, MPD, Pachakutik, León Roldós, Lucio Gutiérez gave freedom of voting to their followers. Most of them, or all, went with Correa, and now that same groups are his biggest enemies. Look, what I can do, Mr. Journalist, is give my time and my money for the love of Ecuador, to the Ecuadorian poor so that they can transform themselves into wealthy and middle class people. GONZALO ROSERO: But you have gone on your knees before the Ecuadorian people. The last time you fell to your knees, it didn’t work. That gesture didn’t bring about anything. You have implored with the Ecuadorian people, that they give you an opportunity, and nevertheless you keep persevering. ÁLVARO NOBOA: I will continue to persevere forty years more. I am going to live to be 150 years old, and I feel like I’m in the flower of my youth. GONZALO ROSERO: How old do you say you are going to live to? 150 years. 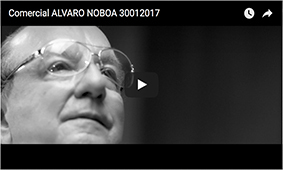 ÁLVARO NOBOA: 150 years. And I feel like I’m in the flower of my youth, I do sport, I am healthy, and I want to tell you something: it took Mandela 50 years. And I’m sure you admire Mandela. It seems strange to me that the journalists say, “There’s Counselor Noboa again,” when nobody said “Again!” to Mandela. They said, “Long live Mandela!” Mandela, what a hero, who was almost 20 years in prison, he began his fight at 30 years old and at 80 became President. GONZALO ROSERO: Last question, Counselor. How are you going to remodel your campaign? ÁLVARO NOBOA: I’m doing it already, with young people. Half of Ecuadorians are young people. Therefore, Ecuadorians should be represented by the young. I am also going to have women participate more and more electorally. Dr. Annabella Azín is going to run on her own merit, she’s going to run for Guayas. In that way, well, I hope that the best women of Ecuador will participate in these elections. I have invited Lourdes Tibán to be candidate for Vice-President, as she’s a woman of the left. Because in ’98 my Vice-Presidential candidate was from the left. I am a man of the center-left. Lourdes Tibán has told me that she already has made a commitment to her party, Coordinadora, what they’re calling a concentration. GONZALO ROSERO: Left wing concentration. ÁLVARO NOBOA: As the first National Assembly member, I will keep on looking for figures like Lourdes Tibán, women of the left, I will keep on looking for young people to represent the youth of Ecuador. More importantly, people like the half of all Ecuadorians have that perception, that you are giving in this interview: there goes Álvaro Noboa again. When Álvaro Noboa wins, he wins. And when he loses, he loses by 2% or 3%. Half of the country thinks like Álvaro Noboa, who is very close and that think like Álvaro Noboa. Hopefully 70% of the country thinks like Álvaro Noboa. GONZALO ROSERO: I wish you success in your campaign, you have all the right, Counselor, and surely the economic possibilities allow you, but on this occasion I’ll give you a prediction. You can take some of the popular votes of the social base from President Correa, as he, at this moment is managing everything, some hiccup is going to happen to him. On the side of the payment of taxes, I have insisted in that you should make it up yourself to be a candidate, your fifth candidacy. And it’s a prophecy that could advantageously be wrong, or however you wish to see it. ÁLVARO NOBOA: I believe that your prediction is correct, but I believe that I don’t have reason to pay what I don’t owe, if I’m already the biggest payer in Ecuador. GONZALO ROSERO: But there are some hundred million dollars, says Carlos Marx Carrasco, that you continue to owe. A hundred million to the Treasury. GONZALO ROSERO: A hundred. He says that you owe that. ÁLVARO NOBOA: Sure, from Dole the collect $708,000; from Chiquita $35,000; and so I beg of you to ask Economist Rafael Marx Carrasco, next time in your next interview. GONZALO ROSERO: He’s called Carlos. ÁLVARO NOBOA: Mr. Carlos Marx Carrasco should call himself Rafael because the one who has organized all of this is Rafael Correa, who is afraid. He’s terrified of getting into the ring with me. GONZALO ROSERO: Correa is terrified of getting into the ring with you? That will remain well engraved in the minds of Ecuadorians who have had the kindness to listen to this interview. I want to thank you very much for the time you have given us, and well, you will confirm in what will be, on the fifth occasion, candidate for President of the Republic of Ecuador. Thank you very much for having attended us, Counselor. ÁLVARO NOBOA: I wanted to clarify to Ecuador – I thank you very much for your time, for listening to me, and my dream is not to be President of the Republic. My dream is to end poverty in Ecuador. Thank you and blessings to all.